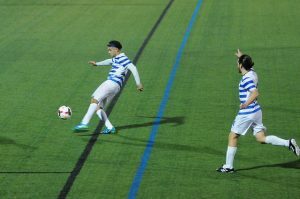 The MSMC Men’s Soccer team took on the SUNY Maritime Privateers last Wednesday night, Oct. 11, in a well fought conference game that ended in a double overtime win for the Knights. MSMC and SUNY Maritime battled it out through two halves of fast paced soccer where both teams were evenly matched. Both teams have been conference rivals for the past several years. Within the first several minutes of the first half, players were already pushing and shoving and taking hits. A free kick was given to the Privateers, to which freshmen goalie Tyler Rapp made the save by hitting the ball over the crossbar. After making the play, the Privateers were awarded a goal kick. Rapp made the save once again, and the score stays 0-0. For the remainder of the half, both teams passed and shot on goal but to no avail. There was not much action in the game until late in the half when a yellow card was thrown. The foul was against Knights player Connor Lynch, who committed a slide tackle against a Maritime player. Following the end of the first half, both teams reported to their respective sides to discuss amongst themselves strategies in order to pull away and win the game. The second half, however, would be a repeat of the first with shots made on goal but not connecting or the occasional save by the respective keeper. Each team had equal amounts of possession and persistence. With the second half ending in a scoreless game, the game enters overtime. Both teams continued to make passes and shots on goal but none result in a score that can seal the game. The game enters a double overtime with still no score. Toward the final minutes of the second overtime period, the Knights scored a goal, thus ending the game. According to the MSMC Athletics page, the goal was made by junior Fred Stark. This game marks a similar comeback for the team, as two years ago the Knights defeated Skyline conference rival Sage College in double overtime. For statistics and more on the men’s soccer team, visit the MSMC Athletics page.